Billboard About Gender Roles Sparks Debate, Protest In North Carolina "Real men provide. 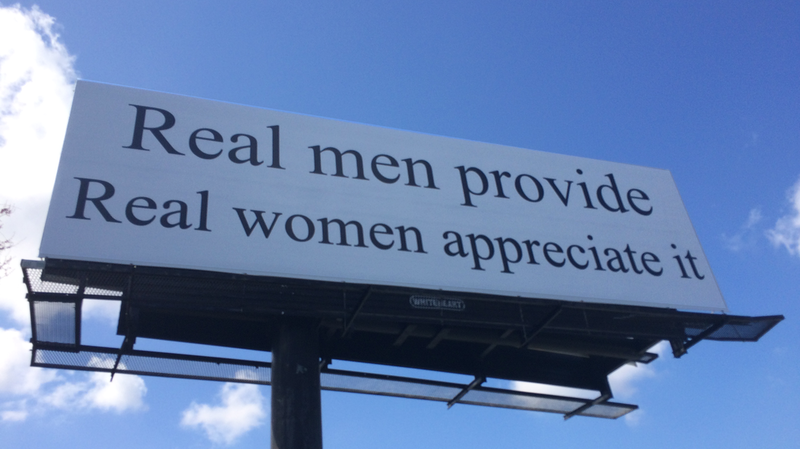 Real women appreciate it," is the message displayed on a new billboard along the highway near Winston-Salem. It wasn't received well by some in the community. The billboard being debated sits off Business 40 Westbound outside Winston-Salem, N.C.
A billboard that sits along an interstate in North Carolina reads, "Real men provide. Real women appreciate it." Although it might be a simple billboard, people have a lot to say about its message. A crowd in downtown Winston-Salem protested the billboard, which has been up for about a week. When business owner Molly Grace first saw it, she said she was shocked. "To me, I see that billboard and people rallying to support it as people wishing it was a little bit more like the olden days, annoyed that it's not and trying desperately to hold on to what is left of those olden days," she says. Organizers of the protest said they're not protesting free speech but rather are protesting the thinking behind the sign. The group created its own messages and painted them on bedsheets. One reads, "Appreciate those who provide, provide for those you appreciate." But they want to do more. They've raised enough money to rent their own billboard that counters the original. "There are no gender roles that define what people can and cannot do for their households and how measurable their worth or their provisions are," Grace said. At the rally, most people spoke against assigning roles to gender, but not everyone agreed. Dana Pavlick, along with her husband and six children, was at the rally. "If you want to bring people into the world, there's a responsible, good way to do it," she said. "And no one has shown how our following patriarchy has hurt society." The owner of the billboard hasn't revealed who's behind it, saying the client doesn't want to be identified and may not be done yet. There are plans to put up another billboard with a different message.